Problem: End-Users receives error when trying to edit a file. "Sorry, something went wrong - The file FILE-URL is locked for exclusive use by USER-NAME"
There is no UI to unlock the locked files - as we do have for Check-in Checked-out files. So, Here is my solution to unlock the locked files using PowerShell. #Write-host "File has been Checked-In"
Don't forget to un-comment the lines 32-33 if you find your files are locked out. Thanks man you are a life saver!!! Where/how do I input this code? Use either PowerShell ISE or Save this script as a .ps1 file and run from PowerShell console. Don't forget to change WebURL and FileURL variables. 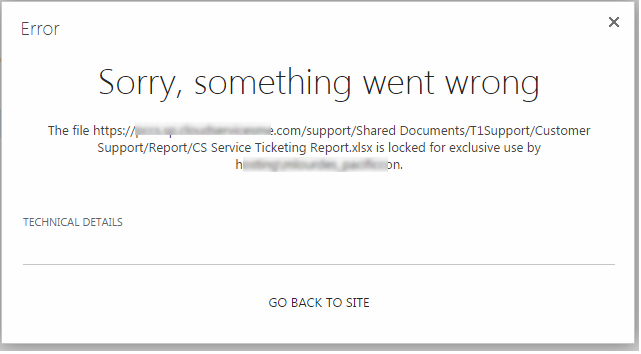 Does it work for SharePoint online? Do you run this script on the server? Where is the setting for the 10 minute lockout. Our network does not have a 10 minute lockout. Is this done manually? I now get the following error: Exception calling "ReleaseLock" with "1" argument(s)." Can I add impersonation to this script? Thanks for the script. Can impersonation be added to this? I now get the following error message"Exception calling 'ReleaseLock' with '1' argument(s)"
Run the script from Farm Admin account or any account which has "Full Control" Web application user policy granted. Getting same issue ,error message"Exception calling 'ReleaseLock' with '1' argument(s)"